The British Chamber of Commerce (BCCT) decided some months ago to offer an evening of informal networking for the members on the Eastern Seaboard. Whilst it was popular enough for the BCCT to continue the concept, it was decided that mid-week was not the opportune time for an event such as this. 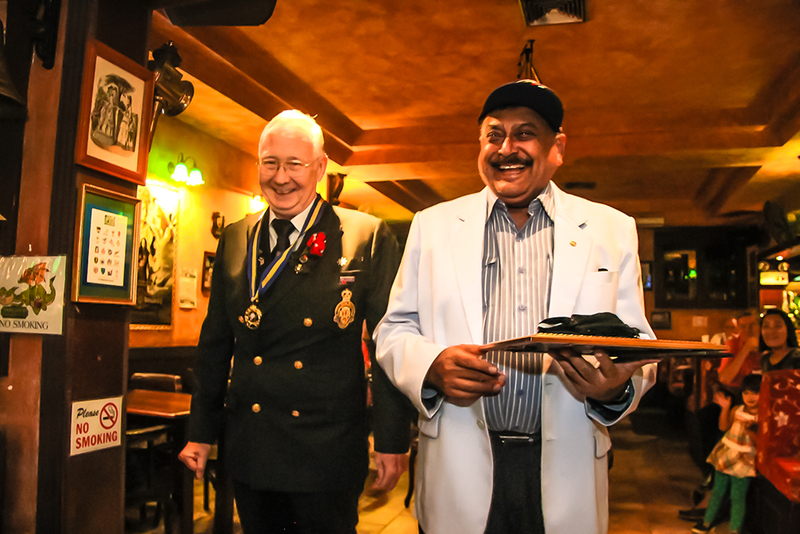 Andy Barraclough (left), Chairman of the Royal British Legion Thailand, presents Pattaya Mail MD Peter Malhotra (right) with a 10 year Certificate of Appreciation. This latest event was then scheduled for a Friday evening at Jameson’s Irish Pub even though there was another function for that date and time. 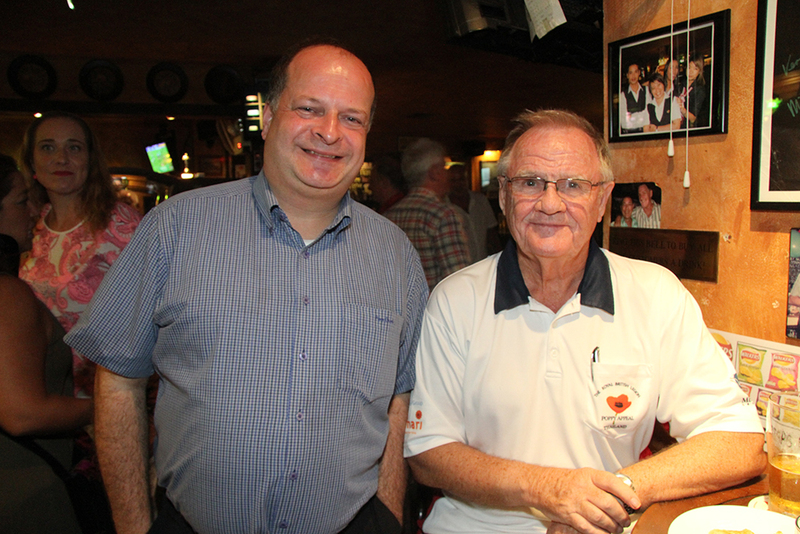 However, despite a slow start, the numbers grew and by 7.30 p.m. Jameson’s was packed. The invitation for the BCCT event was open to all nationalities, and the Aussies obviously had nothing planned as they were there is sizeable numbers. Or perhaps it was the offer of finger food and cheap drinks? The Bangkok Hospital Pattaya was represented by Nui and Tanya from the International Marketing Department who were happy to chat about the preventive plans being promoted by the hospital. The British Legion also took the opportunity of the event to show their appreciation of support for the annual Poppy Appeal. 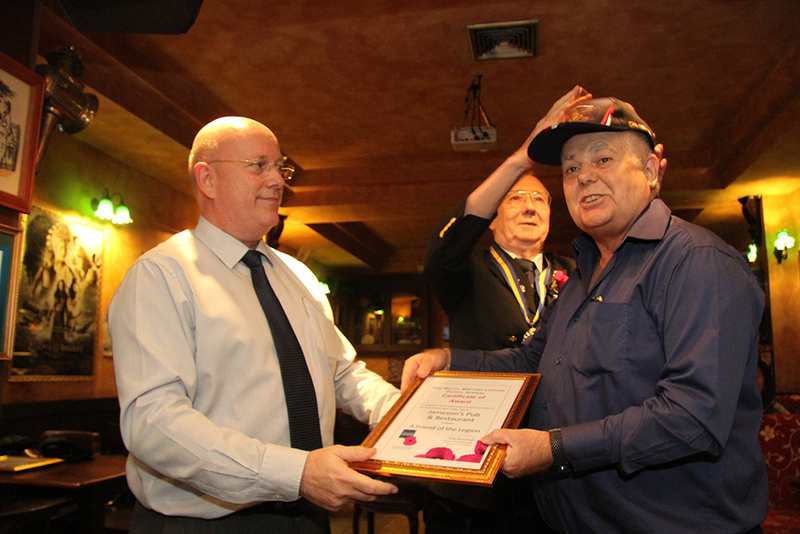 The Royal British Legion, Chonburi Branch Thailand Awards went to many generous folk, including Kim Fletcher for Jameson’s Pub and Restaurant, in recognition of the many years of outstanding support to the Royal British Legion Poppy Appeal in Thailand. Graham Macdonald (left), President of the Royal British Legion Thailand presents Kim Fletcher (right) with a ‘Friend of the Legion’ Award, in recognition of the many years of outstanding support to the Royal British Legion Poppy Appeal in Thailand. 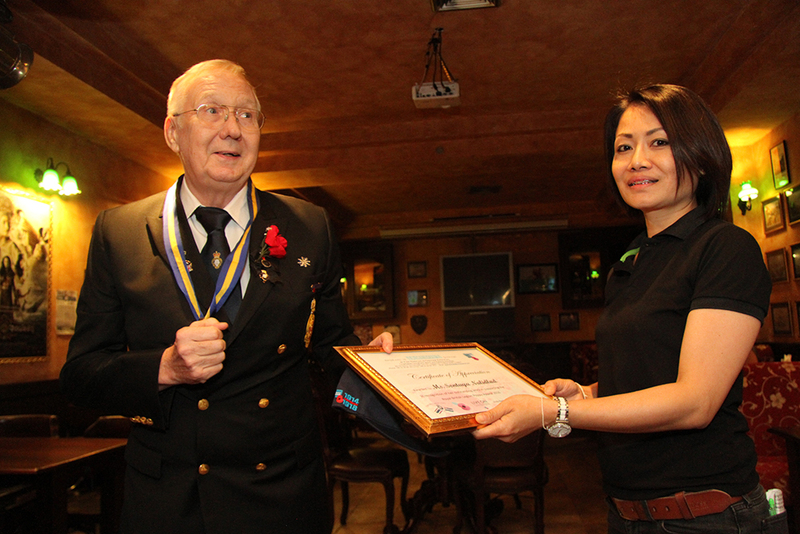 Andy Barraclough, Chairman of the Royal British Legion, Thailand (left) presents Sontaya Nalidlad a certificate of appreciation for being the staff member who contributed the most time, energy and effort to the annual Royal British Legion Poppy Appeal activities which take place at Jameson’s. (L to R) Andy, Peter and Kim ham it up for the cameras. Others included Peter Malhotra for the Pattaya Mail with a 10 year Certificate of Appreciation, as recognition and sincere appreciation of more than 10 years of fulsome, and most generous support, to all the activities of the Royal British Legion in Thailand. 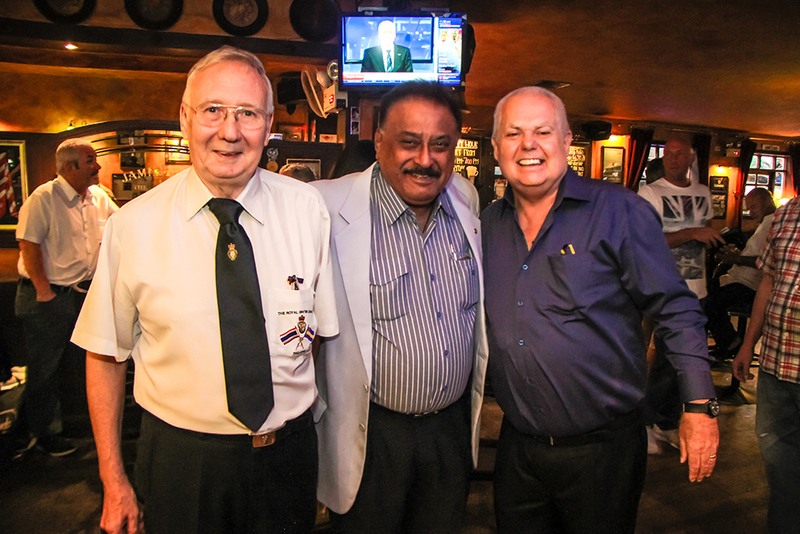 Regulars of Jameson’s Charity Group award went to Ms. Sontaya Nalidlad, the staff member of Jameson’s who contributed the most time, energy and effort to the annual Royal British Legion Poppy Appeal activities which take place at Jameson’s. Kim Fletcher’s award was presented by Graham Macdonald, President of the Royal British Legion Thailand, and for the Pattaya Mail, the award was presented by Andy Barraclough, Chairman of the Royal British Legion, Thailand. The awards were received humbly by everyone and the work of the Royal British Legion was appreciated by all present. After the success of a Friday informal networking, we can expect to see more! 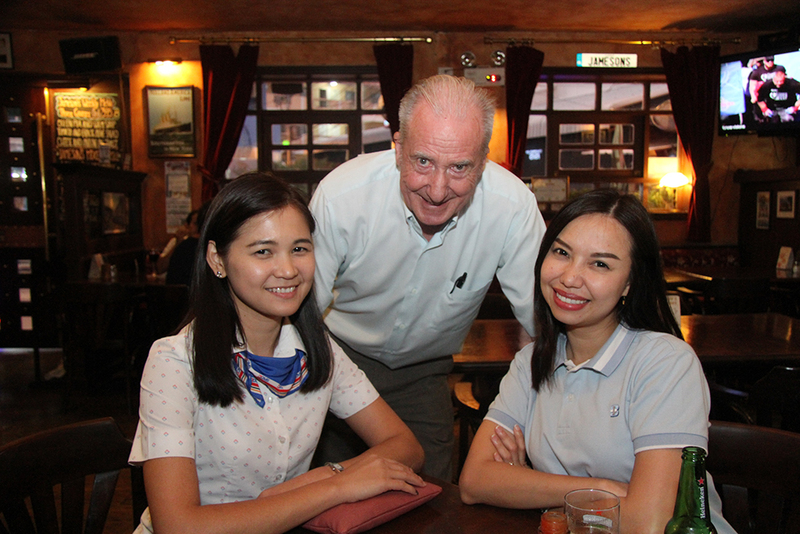 Dr. Iain Corness hovers over Nui and Tanya from the BHP International Marketing Department. The distributer pretties add pulchritude to the evening’s activities. 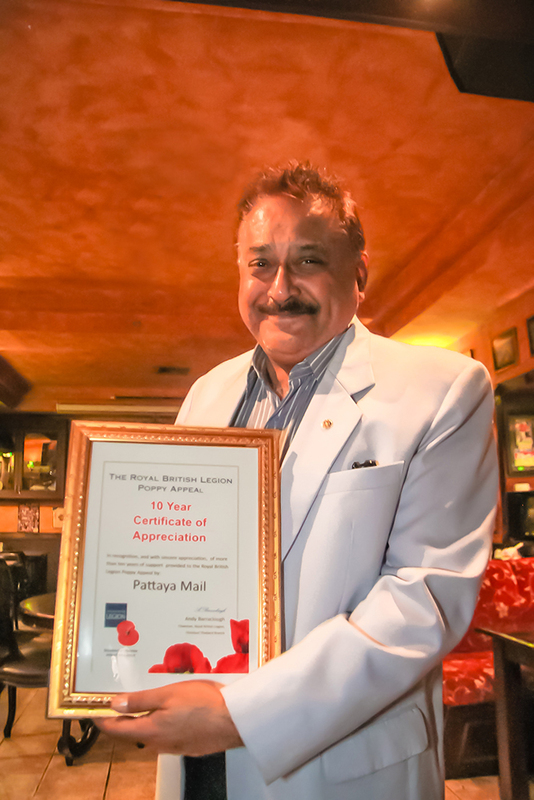 Peter Malhotra proudly displays the Certificate of Appreciation presented to Pattaya Mail for the more than 10 years of fulsome, and most generous support, to all the activities of the Royal British Legion in Thailand. Greg Watkins and Derek Brooks chat during the evening.